We offer high quality Power Ventilators. These devices exhausts hot and stale air from the working space of industries, warehouses, workshops, and other enclosed structures without use of electricity. This equipment does not require maintenance and is known for its effective functionality, as well as its suction properties. - Ventilators vane are manufactured from high grade alluminium including the rivets & therefore highly resistant to atmospheric corrosion. - Ventilators are light in weight and hence operational at very light wing speed. We are involved in manufacturing and supplying a high quality range of Industrial Roof Ventilators. Our high precision engineered Industrial Air Ventilators are used for the exhaustion of poisonous gases, smoke, dust, humidity & fumes in many industries such as food textiles, automobile, engineering, chemical, pharmaceutical and many other industries. We are offering wide range of Power Ventilators.Our manufacturing system gives us complete authority to offer robust and efficient products at market leading prices. These power ventilators are widely finds its application in huge manufacturing units and industries. These power ventilators are available in different specifications and dimensions. We have been counted amongst the topmost companies in this domain, involved in providing Power Ventilator. 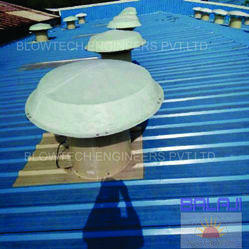 This Power Ventilator is used in various industries and manufacturing units. Our product range is available in different standards according to the customer’s specifications and requirements. MNB Bajrang Steel Pvt. Ltd.